Equal parts alchemist, assemblage artist, and purveyor of all things miasmic, George Herms emerged on the Los Angeles art scene in 1955, at the young age of 20. In the same circle as other Beat generation artists and poets who lived in the bohemian enclave of Topanga Canyon, he soon found his place among his comrades in counterculture. Within this free-spirited environment, they were able to challenge the values of the art world while celebrating a love for society’s cast-off common objects. Here, The Librarian strains to stand up and maintain an erect posture under decayed books that have become unreadable. A bell hangs from an appendage, and tomes from various literary genres struggle to cling together and remain legible. In this struggle, The Librarian serves as homage to the small-town librarian. Herms’s art stands as an excellent counterpoint to the American postwar desire for the newest and latest consumer goods. His ambiguous artworks remind us that emotional attachments, while ephemeral, are strong bonds that are hard to break. This collection of books, prints and other found objects was assembled by California artist George Herms. It is actually a portrait, among the first in a series he called “life forms.” In them, he delights in putting discarded objects in new contexts, rescuing them from the trash heap of history and recasting them as art. Called The Librarian, this piece is a tribute to a real librarian who had a profound influence on Herms for introducing him to the novels of Joseph Conrad and other important literature. Short and stout, the sculpture actually resembles her. The books, in various states of decay, were not selected for their content. They were simply what Herms found in a dump in Larkspur, in the San Francisco Bay Area. He nailed them haphazardly to a wooden support—a witty contrast to the neatness and order of a typical library. Just to the left of center, there’s a nod to more traditional art: a print of a well-known 15th-century Nativity scene from the Netherlands. Beside it, there’s a photograph of an African-American woman. Herms worked on The Librarian for over a decade. He considered it not only a memento, but an affirmation of permanence in the face of a culture of waste. The red stool was added later. 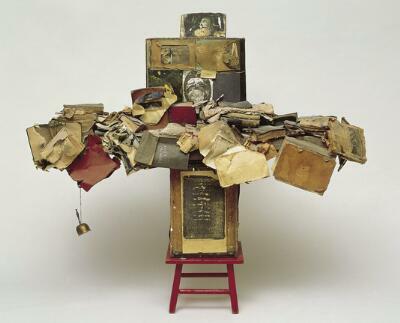 When The Librarian was first displayed at the Pasadena Art Museum in 1962, it lacked a pedestal. Herms and curator Walter Hopps found this old stool, which was just the right height, in the museum’s basement. It’s been part of the sculpture ever since.